In fact, these days you don't even have to taste wine to enjoy a day in the winelands. From accommodation, farmer's markets and literary festivals to rock music festivals, mountain bike trails and full-moon hikes, eco-tourism is creating huge public awareness around sustainability issues including recycling, energy conservation and minimising environmental footprints. Eco-tourism has become key in conserving biological and cultural diversity within a region. Job creation within local communities is one of the positive spin-offs. The high yield, low impact tourism model is a good fit in the winelands, which typically offers highly personal and exclusive experiences to small groups of visitors at a time. Eco-tourism is broadly defined as "responsible travel to natural areas that conserves the environment and improves the well-being of local people" (The International Ecotourism Society, or TIES, 1990). The mutually beneficial relationship between conservation, local communities and sustainable travel is at the very core of successful eco-tourism. 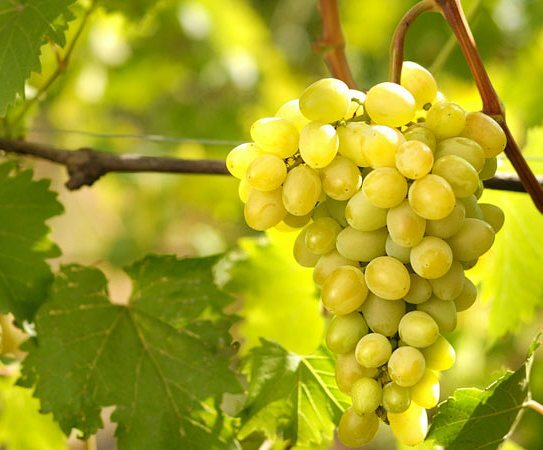 Most of South Africa's vineyards lie in the Cape Floral Kingdom, the world's smallest yet richest plant kingdom. 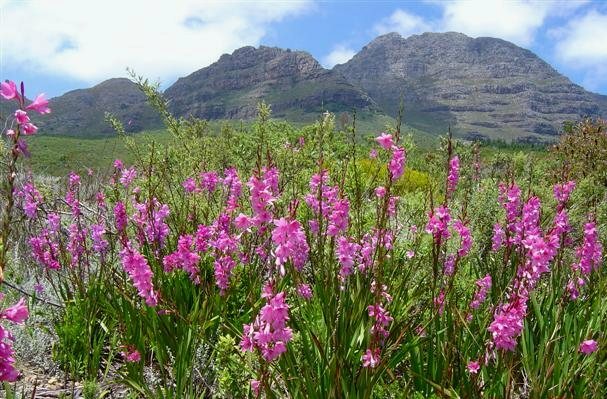 Recognised as a global biodiversity hot-spot, and with World Heritage site status since 2004, the Cape Floral Kingdom and its two main vegetation types, namely fynbos and renosterveld, has come under increasing threat due to urban development, agricultural expansion and invasive alien species. Unlike fynbos, which happily grows in poor soil conditions, renosterveld prefers the sort of fertile, fine-grained soils that are also ideal for cultivating wheat and vines, placing this natural vegetation under even greater threat of being wiped out. Since 80% of the Cape Floral Kingdom is privately owned, it has become obvious over the years that landowner participation in the conservation process is imperative. 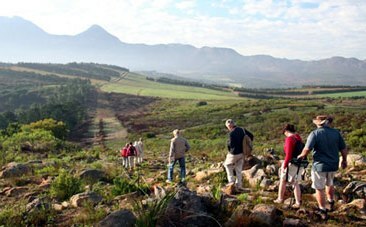 In 2004, with a mere four percent of pristine renosterveld left untouched and much of the Cape Floral Kingdom's lowland fynbos ecosystems under threat, the wine industry developed a conservation partnership with the Botanical Society of South Africa, Conservation International and the Green Trust, which led to the establishment of the Biodiversity and Wine Initiative. In a nutshell, the Biodiversity and Wine Initiative (BWI) aims to minimise the loss of threatened natural habitats, as described above, and contribute to sustainable wine production through better land management practices on farms. In the past, individual members of the BWI have worked hard to establish conservation management plans for their land. While they have done great things in raising the profile of biodiversity conservation and eco-tourism, many of them are working in isolation. To put the widespread support of the BWI in perspective, there are over 150 accredited members. Members contract to conserve a minimum of two hectares of natural or restored vegetation on their land, while champion members (of which there are currently 15) are those who have established a full conservation management plan and have committed to conserving at least 10% of their natural land area. In 2008, conservation history was made when the conservation footprint in the winelands exceeded the vineyard footprint for the first time. What this means is that in less than four years, the wine industry has succeeded in setting more area aside for long term conservation than is currently planted under vineyard. With this achievement, South Africa is leading the world in the conservation of biodiversity in this environment. It also illustrates the industry's commitment to protecting our unique natural heritage. 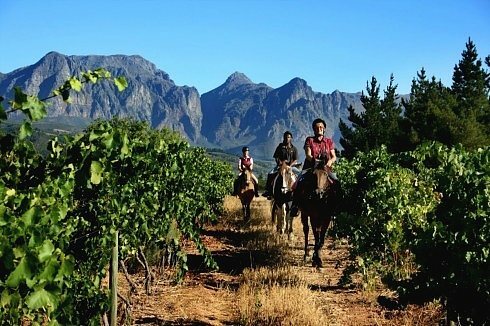 Right now, one of the most exciting emerging trends in eco-tourism in the Western Cape is the way in which wine regions are getting involved by establishing conservancies and developing joint eco-tourism activities, drawing on the network of producers within the same area and pooling their resources. The result is of far greater benefit to the individual, while also raising the profile of the entire region. Engaging with environmentally aware travellers has never been more fashionable or more important. By teaming up with their neighbours, producers are no longer competing for individual attention and business but are rather maximising what's on offer in terms of accommodation, entertainment and diversions within their region. This not only keeps visitors in the area for longer but also heightens awareness. BWI is focusing on assisting the cooperation of individual landowners to form regional conservancies, says Inge Kotze, BWI project coordinator. A fine example of this is the Green Mountain Eco-Route, the world's first biodiversity wine route, incorporating the area around the Groenland mountain and including Bot River, Elgin, Grabouw, Houw Hoek and Villiersdorp. Within easy driving distance of Cape Town, the scenic beauty of the route is ideal as a weekend getaway. 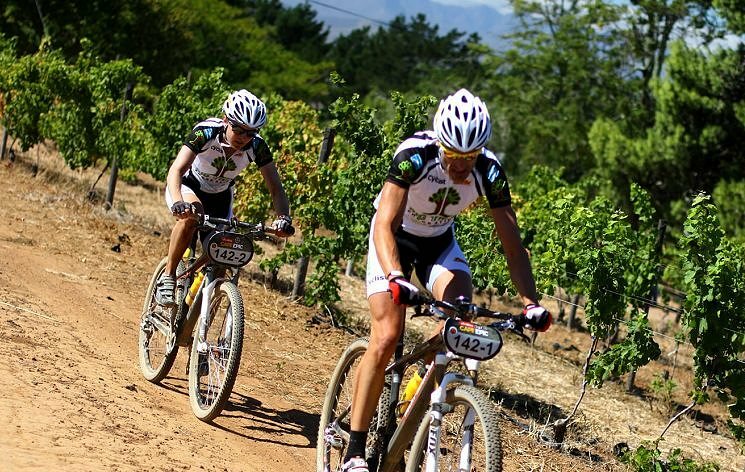 Visitors may choose from mountain biking, hiking, luxury farm accommodation, local produce markets, restaurants and wedding venues, not to mention exceptional wine tasting opportunities at participating BWI member farms (Paul Cluver, Beaumont Wines and Oak Valley to name a few). Paul Cluver, in partnership with Slowine, has also introduced a biodiversity trail around the Groenland Mountain. The "Take a Hike" five-day hiking trail brings you up close and personal with the natural beauty of participating farms and wine estates, some of which provide overnight accommodation facilities. Darling, again less than an hour's drive from Cape Town, is the first wine producing district to be awarded BWI membership status as a district, with all individual farms, including Cloof, Burghers Post, Groote Post, Ormonde and Darling Cellars, achieving accreditation. The Darling Wine Route offers numerous attractions, from glorious wildflower displays in the spring to guided game drives and walks. Rocking the Daisies is an annual music and lifestyle festival held in October. Held at Cloof Wine Estate and endorsed by the World Wildlife Fund, its motto is suitably eco-friendly: "play hard, tread lightly". 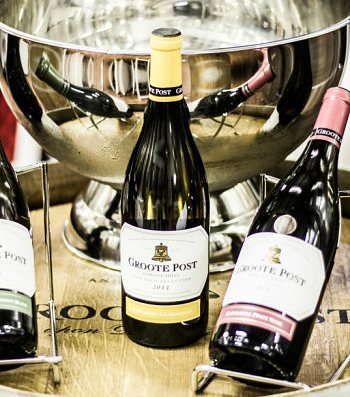 Groote Post has recently celebrated 10 years of wine making, has a long history in conservation and hopes to become a BWI "champion" in the near future. It was one of the driving forces in establishing the Cape West Coast Biosphere Reserve, which incorporates the Groote Post farm and stretches from the Milnerton lagoon to Langebaan. Groote Post is home to 2000 hectares of conservation worthy natural vegetation, including the endangered Swartland granite renosterveld, Swartland shale renosterveld and Atlantis sand fynbos. Eco-tourism opportunities on the farm include wine tasting, Hilda's Kitchen (a country restaurant named after local cook Hilda Gonda Duckitt), nature walks, game drives to view the farm's many antelope, and excellent bird-watching. The farm also holds great appeal as part of the famous West Coast spring flower route. In the Helderberg Basin, the Schapenberg Sir Lowry's Conservancy recently launched its Biodiversity and Wine Walks ("Walks for Wine") in the Sir Lowry's Pass area. Participating in the project are six wine farms, namely Waterkloof (wine tasting and a smart new restaurant is on offer here), Onderkloof (with a tea garden), Mount Rozier, Journey's End, Wedderwill, and Da Capo together with other landowners over whose properties the walks will traverse. The aim is to restore and preserve the land within the Schapenberg Sir Lowry's Conservancy identified by the City of Cape Town as critical and irreplaceable biodiversity corridors. A large part of this area was ravaged by devastating fires in February 2009. The guided walks follow these biodiversity corridors, educating the public as to their importance while raising funds towards their restoration and preservation. Some 24 landowners around the Simonsberg have joined forces and established The Greater Simonsberg Conservancy in an attempt to save the Cape Floral Kingdom. The Delvera Agri-tourism Centre is a focal point of the Conservancy, and offers retail therapy (from olives and ceramics to fashion and wool), a choice of restaurants, a plant nursery, activities for kids and very well organised outdoor pursuits including walking, hiking, birdwatching, and mountain biking (Delvera is also the headquarters of Dirtopia Trail Centre). Particularly popular are the full-moon hikes each month. Hikers walk to the top of Klapmutskop, where there is an indigenous yellowwood forest and wraparound view of False Bay, Table Mountain, Franschhoek and Paarl. There are many more examples of wine farms joining forces to protect their heritage. For BWI's Inge Kotze, "it's incredibly rewarding to see members progressing from individual membership to compliance at a district level, demonstrating how this project is all about action on the ground through the ongoing dedication and commitment to conserving our unique Cape winelands". Dreamcatcher is a unique organisation that focuses exclusively on community-based tourism in South Africa. It was established 25 years ago with the aim of empowering local people, in particular women, through tourism. The Alternative Winelands Tour, facilitated by Dreamcatcher, offers a heart-warming and educational alternative to the mainstream Cape Winelands experience. The tour features insights into the lives of labourers who worked the land during establishment of the Western Cape's wine estates, enabling visitors to learn about the challenges of hostel and farm life and how the community has developed to present day. The tour visits wine estates that have demonstrated a commitment to employees (such as providing access to land and technical assistance to start their own wine label), and features a unique opportunity to prepare (and sample!) traditional food during a cook-up with the "Kamammas" (local women from the area). According to Jennifer Seif, Executive Director of Fair Trade Tourism South Africa, The Alternative Winelands Tour "is an excellent example of professionally organised community-based tourism," opening a window on the lives of ordinary South Africans "through food, story-telling, wine, music and truly South African hospitality at its best." 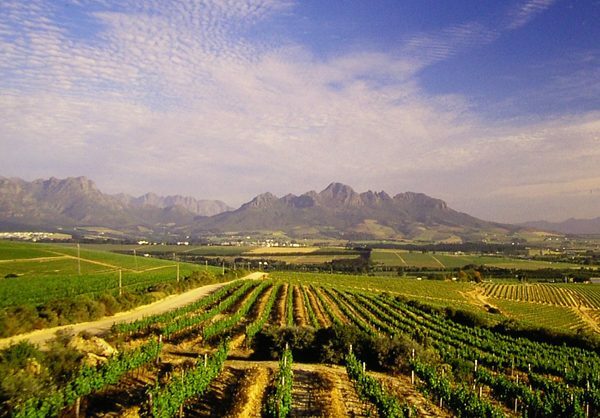 The tour communicates the diversity and majesty of the Cape Winelands through sight-seeing, wine-tasting and personal interaction with farm workers and community members who open their homes to guests. The involvement of the Dreamcatcher Foundation ensures that tourism revenue is ploughed back into community and enterprise development programmes, so the tour is not only enjoyable and educational, but also sustainable.